I have never picked one up. It’s not that I do not want to offer a ride to someone who needs one. I just know better. But I always wonder about a person on the side of the road who is hitchhiking. Where are they going? Where have they been? How did they end up on the street? What would it feel like to be completely dependent upon others to get you from one place to the next? Would it be hard to trust people? I’ve been encountering a lot of hitchhikers lately. These hitchhikers are of a different sort. They are hitchhiking Christians. These are the people who depend upon others for their spiritual growth. They want a free ride. They will cling to their family’s Christian heritage and not build one for themselves. When it comes to learning the Scriptures, they will ride along on the spiritual knowledge of someone else. They do not read the Bible for themselves. They do not pray as they should. They do not study to show themselves approved. Instead they ride from Sunday to Sunday on the preachers words. They ask others to pray and never spend time on their knees. They take what others have studied for themselves, never checking to see if it is true. When you faithfully attend church and hear weekly sermons it is very easy to hitchhike your way through life. Yes, it is easy but very dangerous! One reason it is dangerous is because when it comes to eternity we will not be able to hitchhike our way into heaven. Each man and woman must stand in judgment before God alone. Your church membership will not be able to stand with you. Grandma’s sweet prayers will not be there either. A Christian heritage will not make a difference. Our only hope is the One who traveled the road before us and paved the way – Jesus Christ the Righteous. It is in Him alone that we have access to the Father. When it comes to spiritual growth, a hitchhiking Christian doesn’t get very far down the road either. I know because I’ve been one. My husband came into the faith at 19 years old. He knew nothing about Scripture. Early in our marriage he would ask questions like, “Why do you believe this…?” My answer was simply because that was what I was taught. In other words, my beliefs were not really mine. I just took what someone else believed and rode alone with them. Many of the things I believed were truth. But it was not until my husband challenged me to know what I believe and why I believe it that the truth became mine. Then there were those things that I thought I believed and when I began to search out the Scriptures I discovered that I really didn’t believe it. When I finally began to search out the Scriptures for myself the Word of God became a powerful force in my life. It became alive. And I started growing in my faith. Do you remember the story of the Berean church? The Apostle Paul, with Silas, came to Berea to preach the gospel in Acts 17. Paul was God’s man. God had anointed him in a powerful way. He wrought miracles everywhere he went. He preached with authority. And God would use him to write more books of the Bible than any other. However, when he came to Berea the believers there “searched the scriptures daily” to see if the things he taught them were true. They did not hitchhike along on Paul’s knowledge. They studied for themselves. And God called them “more noble” because they received the word with all readiness of mind. We must be ever diligent in the Scriptures. We must be careful to not rely upon others for our spiritual growth. 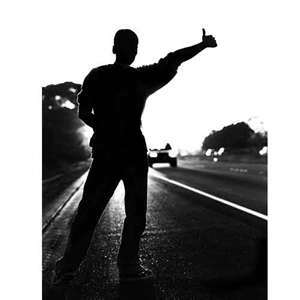 We need to put our thumbs down and quit hitchhiking. Instead, we need to lace up our shoes and “walk worthy of the Lord… increasing in the knowledge of God,” (Colossians 1:10). Love this post! I am challenged by this for myself and for others. I must not also be some one who picks up spiritual hitchhikers, but encourage them to drive their own faith. Blessings to you today. I always enjoy your posts.